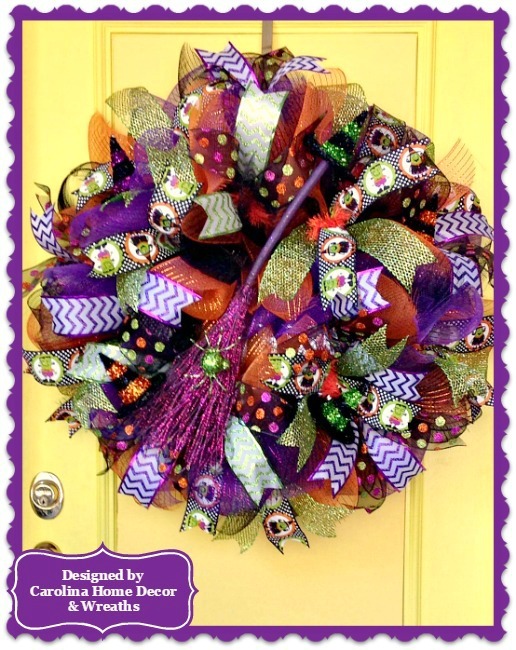 Be the Talk of the Neighborhood with this Spooktacular XL 34"+ Halloween Wreath in Laser Orange, Purple & Black Deco Mesh with new 3 Layer Styling. Features Purple Broomstick Centerpiece with a Small Glittering Black/Lime Witch's Hat at top and a Glittering Lime Green Spider on Broom Base. Glittering Witch's Hat Ornaments throughout. Numerous 2 1/2" Wired Accent Ribbons make this Wreath just Sparkle! Looks Gorgeous on the Door with Excellent Street Appeal. Only 1 Available. Sprayed with Protectant for Outside Use. Ready to Ship TODAY!